We left the Philippines on the 6th day of July, with a storm about to leave Manila,. Unknowingly, this same storm was headed to China....... Xiamen, China to be exact. We arrived at the Xiamen Airport at about 2 P.M. and it was already drizzling. But this did not dampen our spirits, as we headed to a Chinese restaurant for our late lunch. The food was so "yummy" or maybe we were just so hungry that everything that was served on our tables tasted good. 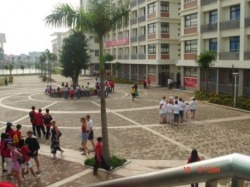 At 4:00 P.M , we left the restaurant l, and headed Xiamen Middle School No.6 , our dormitory. By that time the storm that left Manila has arrived in Xiamen, and we were all soaked in the rain as we walked to Building No.6 to find our rooms. We were all very nervous... .. but the children performed at their best. We the "chaperons" fidgeted on our seats as we witnessed the performances of the other competing choirs. Surely the chilldren's choir was outnumbered , not to mention the fact that in the Music of the Religions Category, majority of the competing choirs were adult choirs. There were only two children choirs competing in this category, both Filipino choirs namely, the MetCC from Manila, and the Sts. Peter & Paul Children's Choir. It's time to face the camera and say... "CHEESE!" The children really had a great time meeting new friends and capturing those newly found friendships through the camera. 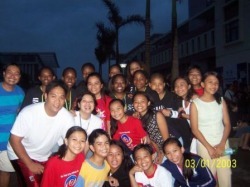 The South Africa Children's Choir and the Sts. Peter & Paul Children's Choir became best buddies at that time. This is Middle School No. 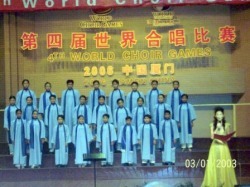 6, the place where the choir stayed during the entire duration of the competition. 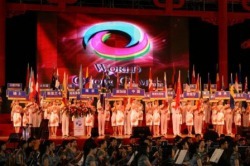 All the competitions were held in the school so the children need not travel that far. Other pictures in this gallery will include some sites around Xiamen, China taken during our day tour.